Centrally located, this impeccable 4-star hotel enjoys proximity to BTS Station, which is convenient for travelers intending to tour the city. The immaculately clean rooms offer superlative comfort while the bathrooms include essential toiletries. The continental breakfast is excellent. The onsite pool and gym allow you to workout at your convenience. Novotel Bangkok Ploenchit Sukhumvit is one of the most remarkable 4-star properties in Bangkok that offers a blissful shelter to its guests. Surrounded by Bangkoks attractions and shopping malls, the hotel offers a comfortable shelter for honeymooners and business and leisure travelers who are seeking for an amazing holiday. The hotel, being at the heart of Bangkok, maintains an inviting pool and fitness facilities with sauna rooms. With its attractive design and modern-day amenities, the hotel is one of a kind. Further, its heart-warming hospitality and incomparable amenities help offer memories for the lifetime. Novotel Bangkok Ploenchit Sukhumvit is just a few minute walk from major attractions like Central Embassy and Central Chidlom. The hotel is set near the popular shopping centers like Central World, MBK and Siam Paragon and is just 20 km away from Suvarnabhumi International Airport. The resort with friendly staff has a total of 370 elegantly decorated rooms which are all well-appointed. It offers rooms under various categories, including Superior Room, Deluxe Room, Premier Room, Junior Suite, Suite Room, and Premier Floor and Lounge. All the comfortable and stylish rooms offer outstanding city views to its guests. Each room has a glass-walled bathroom which enhances a spacious feel and therefore ensuring a relaxing stay for business and leisure travelers. All the rooms are equipped with a cable TV, a working desk, a safety box, ironing facilities, and a minibar. The spacious rooms feature a smartphone for guests' convenience. The bathrooms come with bathrobes, free toiletries and a hairdryer. 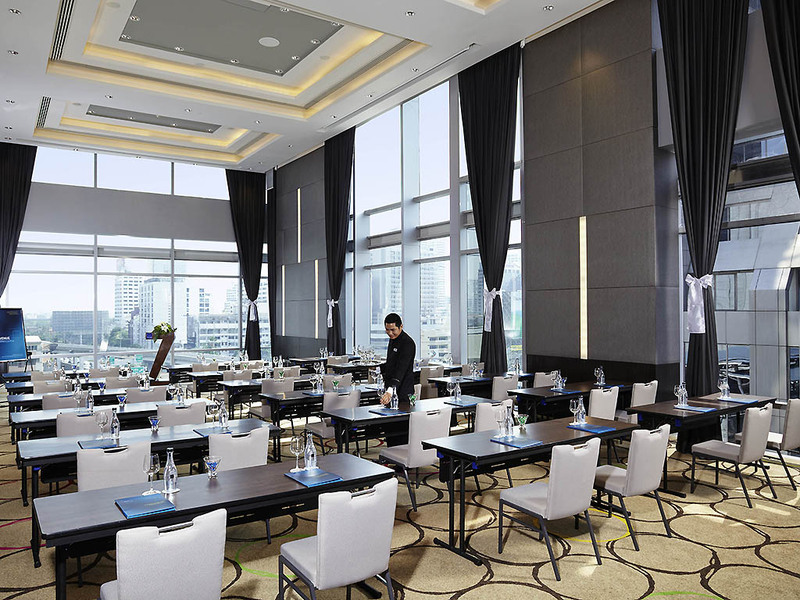 Novotel Bangkok Ploenchit Sukhumvit takes care of all the needs of its guests by providing a number of facilities and quality service. It proudly boasts its pool, fitness center, and steam and sauna room. The hotel maintains 12 multi-function meeting rooms for various events. Transportation arrangements can be made at the concierge counter. Besides, the hotel has a parking area, 24x7 front desk, and foreign exchange counters. All the hotel rooms are appointed with contemporary amenities and complimentary Wi-Fi. It also offers an airport shuttle, laundry, housekeeping and facilities for specially abled guests. The hotel also provides laundry and currency exchange services. It also features restaurants and bars within the hotel premises for the convenience of the guests. 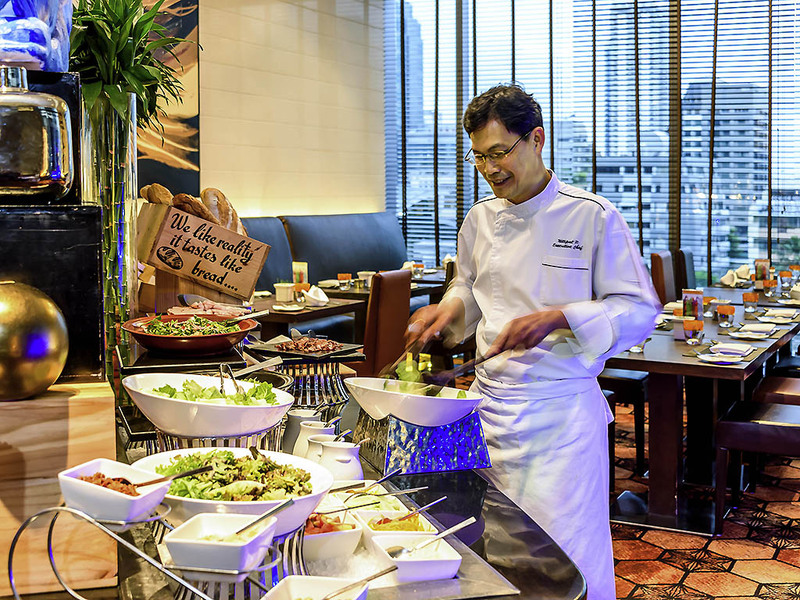 Novotel Bangkok Ploenchit Sukhumvit features a range of dining options for its guests offering delightful gastronomic experiences. The hotel maintains restaurants, namely The Square which serves breakfast, lunch, dinner and all day snacks in between. It offers a range of scrumptious International dishes. Dee Lounge allows its guests to enjoy a wide selection of food, snacks, coffee, and alcoholic drinks. Further, one can gorge on appetizing food with a glass of wine with live music all year round. The hotel provides in-room dining service upon request taking care of the privacy of the guests. Get a healthy and relaxing treatment at the wellness center and spend a memorable and chic stay at the hotel. Enveloped in luxury, Novotel Bangkok Ploenchit Sukhumvit creates the perfect recipe for comfort, relaxation, and indulgence so that the guests can have a great time here during their holidays. 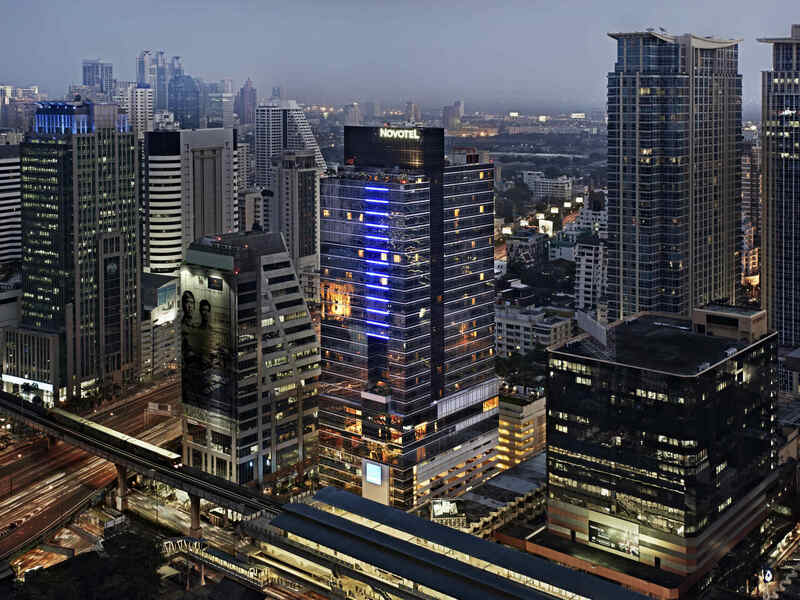 Novotel Bangkok Ploenchit Sukhumvit is located around 45-minutes away from Suvarnabhumi International Airport. Can guests at Novotel avail airport shuttle services? Yes, the hotel provides airport transfer services to the guests. How can one spend their time in and around the Novotel Bangkok Hotel? One can heal the body and mind by being at the sauna room during their stay at Novotel Bangkok Ploenchit Sukhumvit. Other than this, one can go shopping in nearby markets and shopping centers and fitness freaks can avail the services of the fitness center. Does Novotel Bangkok provide currency exchange facility? Yes, the hotel provides a currency exchange facility for the convenience of guests. Yes, the hotel features a steam and sauna where guests may relax and unwind. This 4-star luxury hotel is a perfect place for those who want to spend some quality time with their family and friends being amidst Bangkoks fashion district. This advanced hotel offers a range of accommodation options to its guests. Explore the busy and colorful markets of this place by visiting by being at this hotel. The lavish ambiance of the hotel adds to the beauty of this property that compliments the technological surroundings in an ultimate way. Enjoy a healthy vacation by working out at the fitness center. Guests can enjoy the first-class dining experience at the restaurants. Gain relief at the sauna room while being encircled by the soothing ambiance. In attendance of a friendly and welcoming staff, enjoy the best of services provided by the hotel. The guests have endless ways to unwind ranging from enjoying live music/performance to visiting shopping centers. Guests can also indulge themselves in pool parties and one can go for a shopping date with friends. Novotel Bangkok Ploenchit Sukhumvit ensures that its guests can get a lavish experience and feel a homely and comfortable atmosphere at the same time.